Tag "the marican way Those Above and Those Below"
Amber, America’s former blonde, blue-eyed sweetheart has called for an uprising against the Fascist regime of the United States to oppose Ole Miss, her former teammate who is running for office. Can Jason Fisher, the former New American stop the division between former teammates that threaten to destroy the cultural fabric of the United States? This issue is a reflective one that asks questions about whether good, bad, and people stranded in the middle should do anything about the cultural wars that threaten their societies? Hence, it does not advance the story much from the premise of the first two issues but allows readers to reflect deeper on the meanings represented within. For such a short series, this is an interesting device and almost a detour that breaks the usual course of limited series. Of course, the real value of this comic is to serve as 1970s window into the current cultural wars happening in the 2010s. Trump’s America, is more than about the conflict about the place of blacks in a society that still wonders where they belong. In a sense, John Ridley demonstrates what I believe is a fundamental problem of the way people understand the cultural wars in the United States. Ridley presents the conflict as one about blacks in this society. Marxists would argue that economic reasons are the fundamental problem ignored by cultural wars. The cultural wars in 2018 are more than about the place of blacks. Perhaps, Marxists are right that underpinning all the conflicts generated by the American cultural wars is the economic instability that affects all Americans. In Ridley’s America of the 1970s, cities like Baltimore are ransacked and economic messes. However, the only conflict is that of the white against the black. 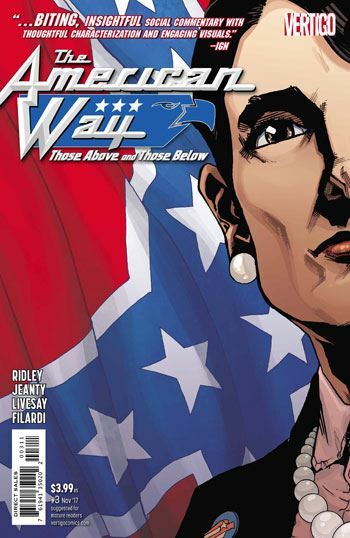 There is no place for women, gays, or even disabled Americans in this discussion, even though to some extent, all are represented in the comic. Ole Missy’s supporters are both economically affluent and distraught. The threat is the black person. But Ole Missy and Ridley in a sense use a dog whistle when they argue that it is a conflict against fascism or anarchy. The comic plays with many of these ideas and that is why I enjoy it regardless of whether I accept its theoretical political premise or not. By playing the dog whistle of the black as the problem of the white, Those Above and Those Bellow characterizes the fundamental situation and context of American cultural and economical politics and why this comic is to some extent a good reflection on Trump’s America. The voices of women, the disabled and the queer are shut off even more in favour of a cultural war focused on race alone. This is the same premise that underpins Trump’s America. The disabled, women, and the queer are as hated as blacks but all of Trump’s energy and vivacity was really energized by the lone advent of Barack Obama to the presidency of the United States. This makes Trump nothing more than a reactionary fighting against the past of an America changing while allying himself with foreign forces to destroy the unique American exceptionalism which is brilliantly exploitable and represented in Ridley’s comic. Looking from the outside, I marvel at the United States constant struggle with itself. Georges Jeanty represents this struggle well in a comic where the pages keep improving.